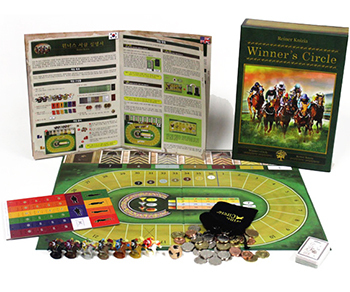 Three races take place during a complete game of Winner's Circle. 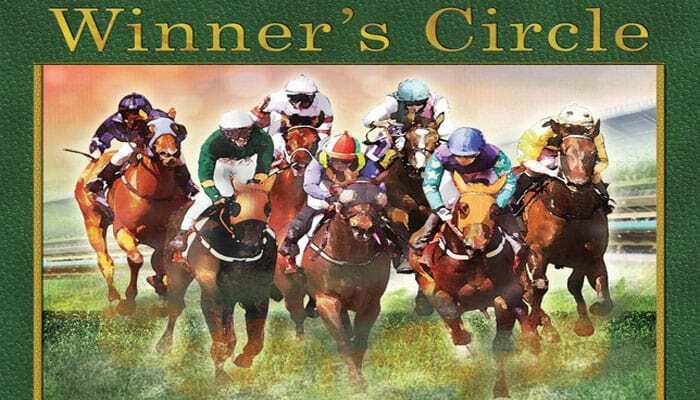 In each race, players place bets on the seven competing horses, spur on favorites with their support, and distract the jockeys of the other mounts. Once the three races are over, the player whose bets have paid off the most wins the game. with a horse's head on three sides and a jockey's cap, a saddle, and a horseshoe on the other sides. 1 Place the game board in the middle of the table with the seven horses, the die, the pace chip, and money next to it. 2 Shuffle the 28 horse cards and place them face down beside the board. 3 Each player chooses a color, places the corresponding color card in front of himself or herself as identification, and takes three betting chips (1, 1, 2) in that color. Place unused color cards and betting chips back in the box. Note: Players use the 0 chips only in the variation that is explained at the end of these rules. Each of the three races has the following stages. Players find out who's running as the horses line up at the gate. 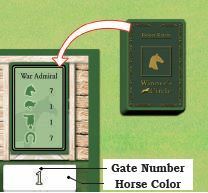 Draw the top horse card from the stack and place it on the first gate of the board; place the horse that matches the color of the gate on the first space behind the gray start/finish line, space 36. Draw a second horse card, then place the card in gate #2 and the appropriate color horse on space 35. Continue drawing and placing horse cards until all the gates are filled and seven horses are lined up on spaces 30 to 36 on the track. Note: To ensure a wider variety of horses in a race (sprinters vs. plodders) you might consider the Royal Turf variant presented at the end of these rules. After examining the horses' strengths, players place bets on three of the horses. For the first race, randomly determine who places the first bet. This player places one betting chip faceup on one of the 7 betting areas, as shown in the picture. This chip represents a "show bet", which means the player thinks that this horse will be one of the top three finishers in this race. Moving clockwise around the table, each of the other players places a betting chip. Repeat this process for two more rounds of betting until each player has placed three bets. Note: Each player may place only one bet per horse, which means he or she must bet on three different horses. A player may place a betting chip on a horse that already has chips placed on it by other players. For races two and three, the player with the most money places the first bet; if two or more players tied for the lead, randomly choose one of these players to go first. The bell sounds, and the horses take off, spurred on by the roar of the crowd. 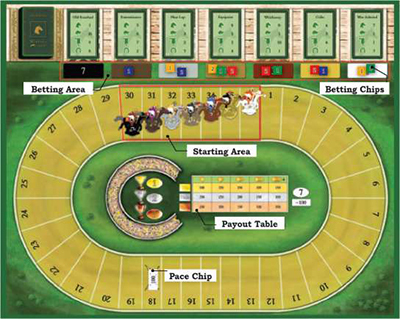 To begin the race, the player who placed the first betting chip rolls the die and moves any horse the number of spaces shown on its card next to that symbol. (Remember that the card's gate and the horse are the same color). Flip the card over to indicate that the horse has moved (see example 1) ; this horse may not move again until all other horses have moved. Moving clockwise around the table, players roll the die, choose one of the faceup horse cards, and move the appropriate horse. 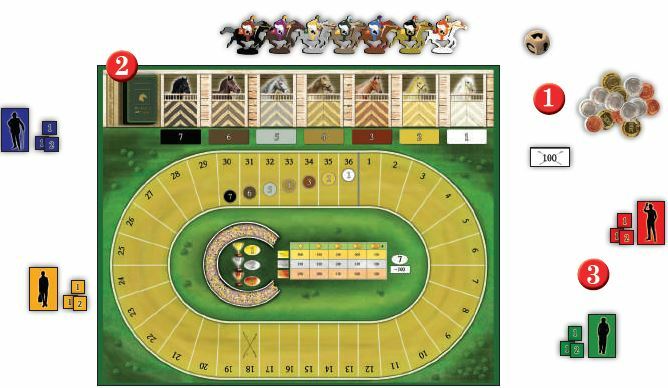 When all horses have moved once, turn all the horse cards faceup; the next player to roll the die can now choose to move any of the horses. On your turn, you must choose one of the faceup cards and attempt to move a horse - you cannot pass. However, only one horse may be on a space. If a horse's move would end on an occupied space, place the horse on the first free space behind its original stopping point (see example 2). In extreme cases, particularly at the start of the race, a horse may not be able to move at all because all of the spaces in front of it are occupied; you may still choose this horse and flip the card face down to indicate that the horse has had a turn (even though it didn't move). Example 2: Horse 'A' is going to move 6 spaces. A moving horse is not allowed to end its move in a space currently occupied by another horse. For this reason Horse 'A' may not end its movement in either space 17 or 16. Instead it must end its move in space 15 after moving just 4 spaces. The first horse to reach or pass space 18 is now the pace horse and pays out an additional 100 per bet. To indicate this, place the pace chip in this horse's betting area. Place the first (Win) horse to cross the gray finish line on the spot next to the payout table; remove this horse's card from play. The second (Place) and third (Show) horses to finish are treated similarly, being placed on the and spots and having their cards removed from play. 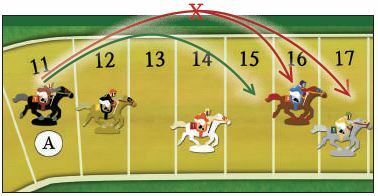 Once the third horse crosses the finish line, the race ends; place the horse currently in last place on the spot to the right of the payout table. Now it's time to hand out the winnings! Players who bet on the right horses reap the rewards, while others tear up their tickets in disgust. The payout table is located in the center of the board. To determine how much each winning bet is worth, first total the number of bets on the three winning horses: each chip counts as one bet and each chip counts as two. Then look at the appropriate row (Win, Place or Show) on the payout table and move along that row until you hit the column that matches the number of bets on that horse. The amount in this box shows what each bet on this horse is worth. Each player with a chip on this horse receives the amount listed, while each player with a chip receives double this amount. If the pace horse was one of the three winning horses, then each player with a chip on the pace horse receives an additional 100 for a |1| chip or 200 for a chip. Each player with a chip on the last-place horse (the horse on the spot ) now pays the bank 100 for a chip or 200 for a chip. A player that does not have enough money pays all that he or she can. Note: In the third race, all payouts to players and the bank are doubled! Return all betting chips to the players, discard the seven used horse cards. If this was the first or second race, head back to "The Race Preparation" and get ready for the start of the next race. At the end of the third race's payout, the player with the most money wins. Win: Player A has a Chip (=2 Bets) on the winning horse. Since no other player has a chip on this horse the payoff can be found in the second column. place: player b has a chip and players a and c have their chips on the horse finishing second. This horse's payoff can be found in the fourth column. -> Player B will receive 300 and Players A and C will each receive 150. Show: Player Chas a chip on the horse finishing third. This horse's payoff can be found in the first column. -> Player C's payoff will be 250. Pace Horse: The second place horse received the pace chip. Players betting on this horse receive a bonus payout. -> Player B will receive an additional 200 and Players A and C will each receive an additional 100. Player C has a chip and player d has a chip on the last place horse. players betting on this horse are penalized. -> Player C must pay 200 and player D 100.